For the past three years, Chabot has been diving deep into the Common Core Standards covering English and language arts, mathematics, history and social science, and science. For reading and writing we use the Lucy Calkins workshops from Teachers College in New York. For Math, we use the OUSD approved Expressions curriculum. Science is a combination of FOSS and Next Generation Science Standards. All of our courses focus on collaborative learning, inquiry, problem solving and critical thinking. Within this framework, our multi-talented teachers create their own curricula, often team-teaching and creating innovative learning plans. 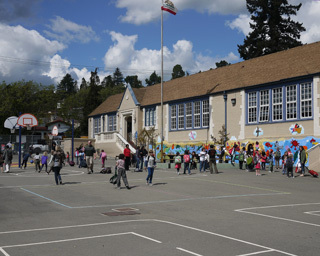 To supplement the educational resources available through the Oakland Unified School District, the Chabot PTA funds educational enrichment programs in art, music, library/media, science, gardening, and Spanish. See the Educational Enrichment page for more information. Social and emotional learning (SEL) is a process through which children and adults develop the fundamental skills for life effectiveness. These are the skills we all need to handle ourselves, our relationships, and our work effectively and ethically. Everyone strengthens their social competencies to connect across race, class, culture, language gender, sexual orientation, and age. At Chabot, we recognize that students need to feel safe, mirrored, and valued in order to be able to engage in the academic rigor we expect from them. Beginning in September of 2016, all classrooms will be implementing the Caring Schools Community Curriculum. We also have a site lesson for Inner Explorer’s online Mindfulness program, used by many of the teachers. Additionally, many of our teachers use their own curriculum, activities, and strategies to build community in their classrooms. For more information on SEL Learning in Oakland Unified School District, please click here.